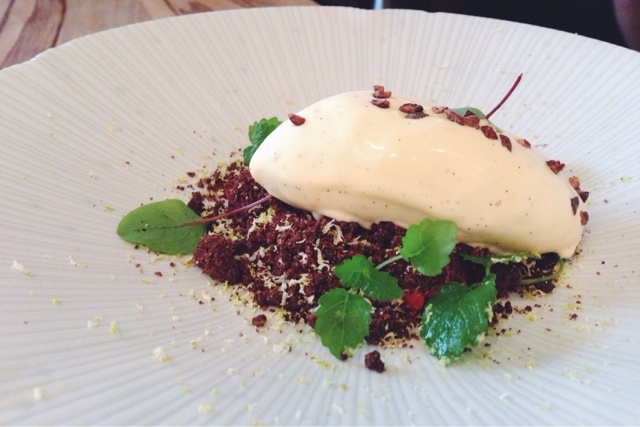 Arbutus, London | ivy eats again. "Wait, you never been fine dining before?" I was surprised to hear from my friend that he'd never been to a high end restaurant. I knew I had to take him somewhere, a place that would not break our wallet. What's more, he is leaving me behind in London and moving to Chicago. It needed to be a leaving celebratory meal. It was not easy to pick somewhere that would not cost the bomb, finally settling on Arbutus for their valued set lunch deal. What's more, Arbutus is a one star Michelin restaurant in central London of Soho focused on modern European cooking from the brainchild of Anthony Demetre and Will Smith (not the huge Hollywood star) of Wild Honey and Les Deux Salons. I may have not heard much about Arbutus before, but I am one of those people that will studied the menus in advance. Going for a set menu, usually meant there are less choice but that is fine with me when the prices are so much reasonable than the not so affordable a la carte menu. It is not really fine when there is no amuse bouche. I love amuse bouche, I love the surprise that you get and it is always so tasty. Some places gives a lot of amuse bouche and some gives you nothing, it is underwhelming. You always expect surprise from a high end restaurant given that you are paying for so much and it is a showcase of what the chef can offers. 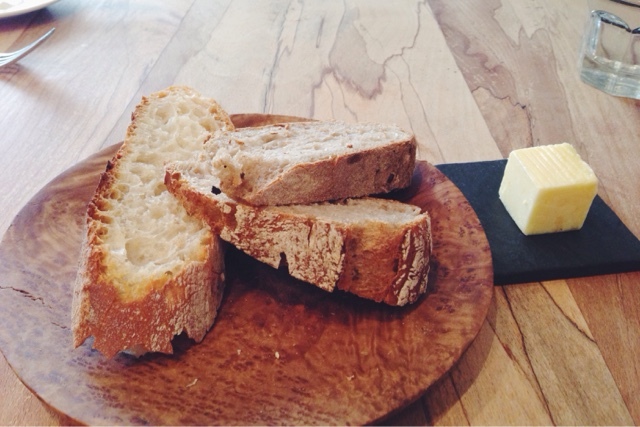 The bread was good, so good with the butter that we had a second plate of it. It wasn't until Mr. T told me, his pressed rabbit dish was plated like a rabbit shape. I was having a blonde moment there, not that I am blonde. He liked it, saying the flavour was good just not an outstanding dish. Whereas the salmon tartare that me and Calvin both ordered was overwhelmed by the olive oil taste which totally overtook the salmon taste. 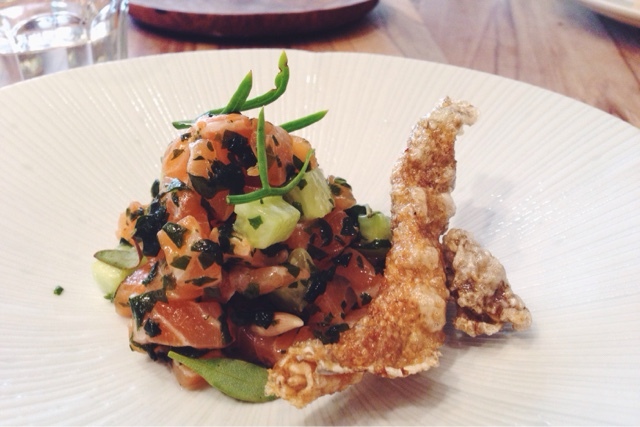 The cucumber gave it a good crunch and I loved the crispy salmon skin. It tasted just like those deep fried crispy fish skin you get in congee or noodle shops in Hong Kong (having a bit of nostalgic moment). I knew I should of have went for the beef as my main, just look at that piece of meat. The boys went for the beef, it was so tender, juicy to medium rare and full of flavour. It was not really a thin slice not that anyone was complaining. It took us a while to work out what that greyish slab of thing was on the plate which was aubergine as it didn't have much taste to it. Looking at my fish, it was definitely in the shadow. 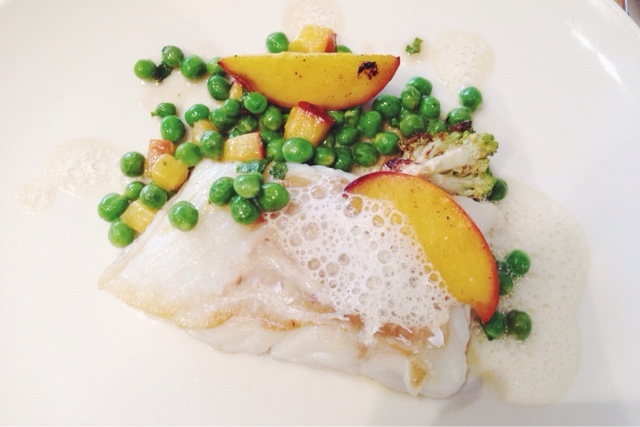 The cooking of the cod was perfect, but overall the dish was lacking bold flavours even though nectarines and cod miraculously somehow works together. Sometimes, you don't need a fancy dessert to end the meal. You would want something hearty and something that taste good. The desserts was simple but made with skills. Seeing how Mr. T was licking every spoonful of his summer berries and vanilla ice cream, you know it was very good with the chocolate soil. The dessert me and Calvin both opted had an aquired taste, the olive oil sponge had a sponge texture that you'd never had before and it was slightly on the dried side. 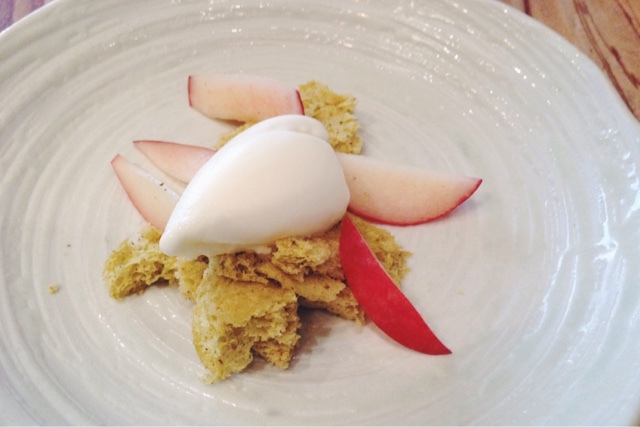 Without the sponge, the peaches and yoghurt (it was like a sorbet) was perfect. I think I can have a bowl of it on its own, just minus the sponge. We went on a Sunday lunch and the restaurant was quiet and empty. We didn't order any drinks knowing it would had bump the cost up marginally as we were trying to keep it as low as possible. Although a glass of Pinot Blanc would have been perfect with the fish. The service was very much tailored to your table, given there was only like 3 other tables with diners. The food was uninspiring, it tasted perfectly wonderful just missing the enjoyment and surprises. 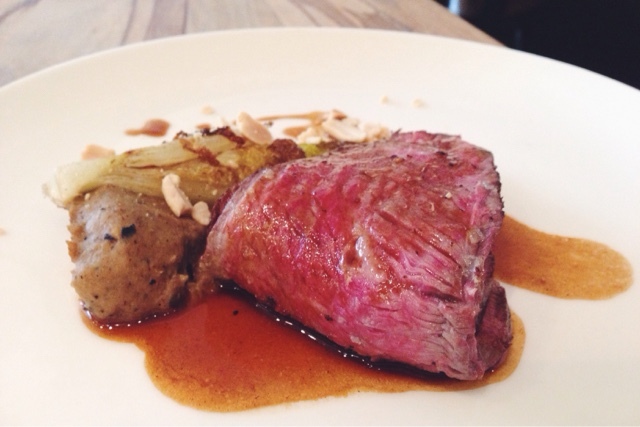 £25 for 3 course would be a fantastic steal if the food was truly amazing. Arbutus is definitely miles better compared to my own western cuisine cooking. I felt there are better cookings from lesser known and not award winning restaurants but probably not at this price. 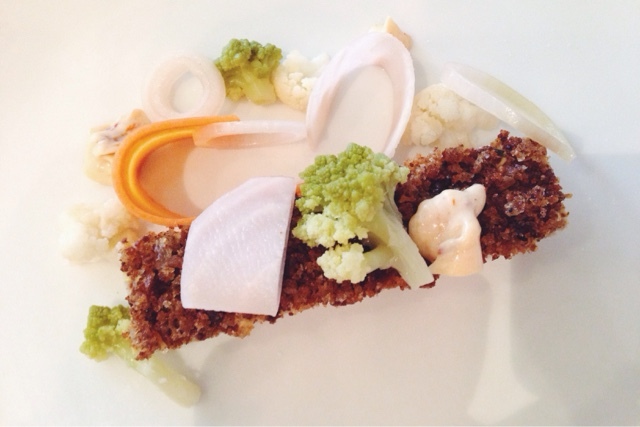 Posted by Unknown Labels: Arbutus , food , Michelin , One Star , reviews , Soho.